Professor Peterson’s presentation will show the size and durability of the achievement gap and analyze alternative strategies for closing it. Registration deadline is April 29 at Noon. 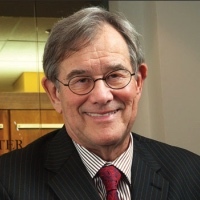 Paul E. Peterson is a Senior Fellow at the Hoover Institution, the Senior Editor of Education Next: A Journal of Opinion and Research, and Henry Lee Shattuck Professor of Government and Director of the Program on Education Policy and Governance at Harvard University. He has evaluated the effectiveness of school vouchers and other education reform initiatives. He is author or editor of numerous books, including Saving Schools, which documents the forces that undermined the effectiveness of a once dynamic educational system. His recent book (with Eric Hanushek and Ludger Woessmann), Endangering Prosperity: A Global View of the American School, documents the large economic costs of a stagnant K-12 education system. He served as a member of Hoover's Koret Task Force on K–12 Education between 1998 and 2013.